As part of St Patrick’s Day celebration this year, Guinness Stout have kicked off A Taste Of Guinness In The Kitchen This St. Patrick’s campaign so that we can cook up a feast using Guinness by sharing with us some recipes. Some of these recipes were developed by Guinness' in-house chef, Justin O’Connor, while some were unearthed from Guinness archive. 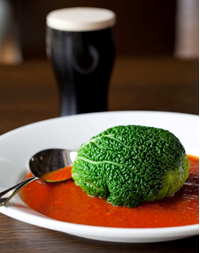 Using Guinness as an ingredient is nothing new as I've used it myself in some of my cooking. 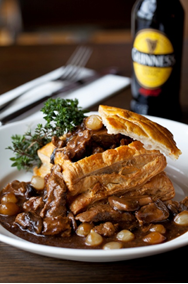 For a savoury dish, I've my version of Beef & Guinness Stew. You'll be very surprised that other than the usual usage in stews, it can also be used in sweets. For a start, I'm going to share the savoury dishes courtesy of Guinness Anchor Berhad. The following Friday, I'll share the sweets. To find out all the exciting happenings and participating outlets, visit www.facebook.com/guinnessmalaysia for more information! In a pot seal the diced beef and brown all over. The vegetables are then added and cooked out for 4 -5 minutes. Add the herbs and beef stock. Now add the Guinness. Slow cook the beef over a stove for 1- 1 ¼ hour. Add a little water if needed at the end. Cut the puff pastry into 8 even pieces. Egg wash each piece of pastry. Using one piece of pastry place it on top of another piece of pastry to form a double case. Do this with the rest of the pastry to form 4 double pastry cases. Using a knife score the top of the pastry to give the effect of a vol au vent. Now bake at 200C for 14 minutes. When cool cut the top of to form a lid. Core some of the pastry out for the centre of each case. Spoon the hot beef into each case and serve. Slice the loin into 8 pieces and place in the Guinness overnight in a fridge. Dice up the peppers and wedge the onions, season and coat in olive oil. Add the rest of the marinade in on top of the lamb and continue to marinade for 2 – 3 hours. 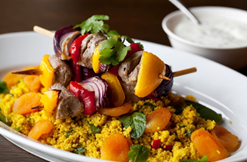 Now skewer the lamb and vegetables evenly onto 4 skewers. To cook place in the oven for 8 minutes at 180C or char grill until evenly cooked. Serve with a minted yogurt. Blanch the cabbage leaves in boiling salted water for 3 – 4 minutes and cool in ice water. In a pot sweat of onion, mushroom and garlic with a little olive oil for 4 -5 minutes without colouring. Pour in the stock, barley and thyme in on top. Cover with a lid and slow cook till barley is tender, add more stock if needed. When barley is cooked add the cream and parmesan cheese and cook out for 2 -3 minutes. Season to taste. Using 4 small teacups line them with cling film and place the drained cabbage leaf in side to cover leaving some cabbage leaf over the edge. Now fill the cup with the cooked barley risotto and cover with the overhanging cabbage. Using the cling film take out of the cup and twist the cling film around the risotto to form a ball. Serve while hot or let it cool and reheat in the microwave. 1.4 kg of corned beef soaked in pint Guinness overnight. Place the beef and Guinness into a pot and cover with cold water. Add onion, cloves, bay leaves and peppercorns. 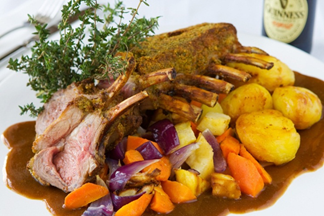 Cook for 2 – 2 ½ hrs or until tender. Cook the potatoes in salted water, drain and mash. Add 100g butter, ½ the cream and spring onion. Season potato to taste. Boil the sliced cabbage in salted water for 5 minutes and drain, add a knob of butter and season. Take 100ml of the cooking stock and place in a pot, add the other 200ml cream and simmer for 2 minutes whisking in 50g butter. 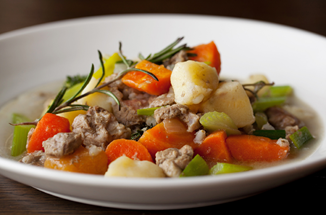 Put the lamb and the GUINNESS® into a bowl, cover and allow to marinate in the fridge for 6 - 8 hours. Take the lamb out and coat it with the mustard. Then press the lamb into the herb breadcrumbs. The crumbs will stick to the mustard and make a nice crust. Then simply roast in the oven at 200° C for 20 - 25 minutes. Serve with roast vegetables and champ potato. Delicious. In a pot put the meat, bouquet of herbs, barley, onions, carrots, celery and turnip and cover with chicken stock. Simmer gently for one hour. Skim off the scum on top. Add the potatoes and continue cooking for ½ hour. For the last 5 minutes add in the leek. Remove the bouquet for herbs. Cut the beef into 2 inch cubes and brown in margarine together with the diced onions and finely chopped garlic. Add the puree, the peeled and sliced tomatoes, paprika and a little cayenne pepper and salt. 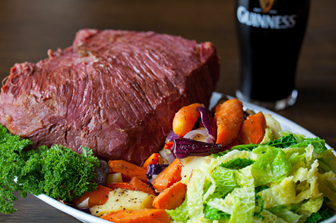 Pour over the GUINNESS® and cook in the oven until the meat is tender. 45 minutes before serving add the potatoes. Skim off the surplus fat and serve with a little grated cheese. Melt the butter with the oil in a frying pan, brown the pork quickly on both sides, remove and keep warm. Add the onions to the pan and cook until starting to go golden (do not allow them to burn). Add the flour, stirring and cook for 2 minutes. Gradually add the GUINNESS®. Add diced apple and replace pork with mustard and seasoning. Bring to the boil, cover and simmer for 20 minutes. Check seasoning before serving pork with brown rice and vegetables. Thank you Guinness Anchor Berhad and G2 Public Relations.